Every instrument has a way of making melody notes sound bigger and more interesting. On the harmonica, the most powerful and natural way to reinforce a single note is by lifting your tongue selectively to add notes from the neighboring holes. 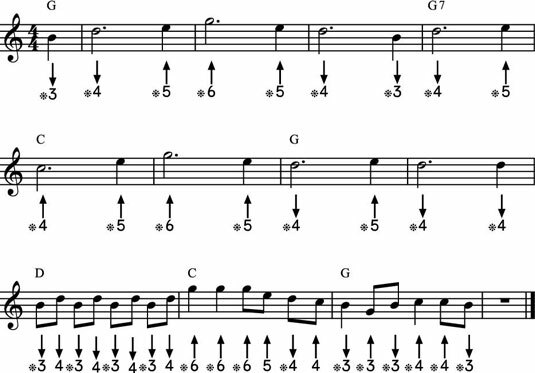 Because all these notes are part of a chord, they reinforce one another and make the whole sound bigger than its parts. Here, you will find two essential techniques to reinforce melody notes. Each technique creates its own effect. After you learn these effects, you can use your own taste and judgment in applying them to melodies. You also can get ideas on ways to use these techniques by listening to how professionals employ them. You can see the tongue actions for these techniques on the harmonica. Start with a chord that has the melody note at the right side of your mouth. You start the slap by playing a chord with the melody note on the right. Perform the slap by covering the other holes with your tongue, leaving only the melody note. After the slap, your tongue isolates the hold that plays the melody note. Here’s a tune called “Slappin’ the Blues.” When playing this tune, you start each note with a slap. The asterisk just before a note indicates that you start that note with a slap. A pull-off is similar to a simple tongue lift but with one important difference: It has a sharp, percussive attack. For both techniques, you start with a melody note and end up with a chord by removing your tongue from the harmonica. However, when you do a pull-off, you create a percussive attack for the chord by blocking all the holes before pulling your tongue off. You only block all the holes momentarily. When you do this, you create a buildup of air that is suddenly released when you pull your tongue off. For some reason, pull-offs seem to be more effective on draw notes than on blow notes. There are two typical pull-offs in second position on the harmonica. You can stay in Holes 1, 2, and 3. You play Blow 3, then Draw 3, then Blow 3 again, and then you play a pull-off. Or, you can move around a little. You start with Holes 1 and 2 in your mouth, playing Draw 2 and then a pull-off. You move to Hole 3 and play the blow note. You move back to Holes 2 and 3 and play another inhaled pull-off. Even though Draw 2 and Blow 3 play the same note, they have different tonal qualities, and their contrasting sounds alternating with the pull-off adds interest and complexity to the textures you hear when you play this lick. Try using pull-offs to add some punch. When the melody note is a blow note, try following it two different ways and evaluate which one you prefer: with a blow-note pull-off or a draw-note pull-off one hole to the left of the melody note.